If you are familiar with BC wines at all, you should know of Sandra Oldfield and the winery she helped start with her husband Kenn Oldfield and friends Barb and Bob Shaunessy, called Tinhorn Creek in Oliver in 1993 and first vintage in 1994. 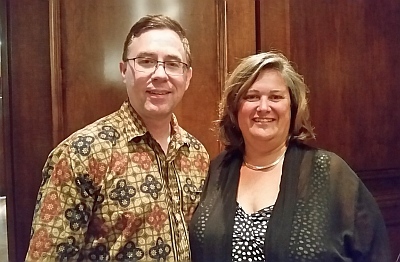 This year, 24 years later, life changed for Sandra and Kenn when Tinhorn Creek was sold to a large Canadian winery called Andrew Peller, which owns wineries in BC and Ontario, including Trius, Hillebrand, Thirty Bench, Sandhill, Copper Moon, Calona Vineyards, and Red Rooster. Also over the summer Andrew Peller purchased BC’s Black Hills Estate Winery and Gray Monk Estate Winery. This is Sandra’s first interview other than one she had done on the radio with Anthony Gismondi. It was hard for Sandra as the feelings of selling Tinhorn Creek were still very fresh. I really appreciate Sandra to do this interview with me, her honesty and her hopes for the future for her and the BC wine industry. What is the favourite wine you produced at Tinhorn Creek? I’d say my heart goes with the 1998 Cab Franc. It was our 3rd vintage producing Cab Franc. I always liked our Cab Franc. It was not probably the best wine I made at Tinhorn, but it was the first wine that told me that Cab Franc was not going to be a problem wine; It was going to be a delight if managed properly. It opened doors for me to exploring Cab Franc that I think became a great thing for the winery. I was wondering if you would say the first vintage of some wine? The ’98 Cab Franc would be 3 vintages into Tinhorn Creek. It was a hot year. Hot years do not always favour Cab Franc, and we were probably not managing it properly in the vineyards at that time. So it was probably the first time that I saw quite ripe Cab Franc grapes. After that time we figured out how to crop it down so it got ripe more frequently. I read somewhere that Argentinean Cab Franc needs more sun than Cab Sauvignon. It is possible in Argentina that is the case. What I have found with Cab Franc over the years it does not well when it gets really hot over 35 degree Celsius; it shuts down, whereas Merlot, for example, keeps going. But it (Cab Franc) seems to really excel in the Fall as soon as the nights turn quite cold, which is the opposite of Merlot, which is why Merlot shuts down. I have found that in the years that stayed hot right thru harvest we were still left with some green flavours even though the brix were high. In the years that got quite cold, like most of them now, that is when the phenolics really excelled in ripeness. You end up with less green in those years as long as your cropping is balanced; a good amount of leaves above a good amount of clusters. We are doing leaf pulling now, but not excessively. I actually found when it is too hot, it puts the brakes on Cab Franc and you have to wait for it to cool to excel. It is not necessarily relatable to Argentina, as what they think is hot might be different, and how they are farming it can be different. What at your time at Tinhorn Creek is your favourite accomplishment? I’d say this last year was really my favourite. I can’t point to one particular thing; I can just say that things were clicking from a person perspective and to me, people were finding their niches. We had a very stable workforce, and people were happy to come to work. We were working through problems in a good way. Most owners would say if employees are happy and are happy to come to work, it is the cherry on top of the dessert. 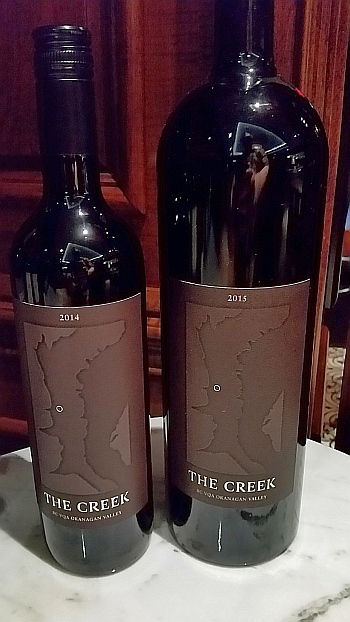 When you came out to Vancouver to show off “The Creek” and the other wines in August, I said you seem more happy than usual. Everyone from Tinhorn in the room that knew the sale was possible all had signed confidentiality agreements. We were unclear if it would happen and some of us, including myself, were hoping it wouldn’t. You see, Kenn and myself were minor shareholders. Were you still going to be a part of Tinhorn Creek? You seem like you were enjoying it. I was. I really did enjoy it. It was great. Lots of winemakers or winery owners that have left a winery have started up their own afterwards. Is that you? That is not me, *laughing*. But, I won’t say never. In 3 years you could see me launching a new brand. I can’t see myself starting another winery. But like it said I’ve seen enough in this industry to never say never. I know what it is like I had my own business before and when I sold it, I never had the same amount of enthusiasm. I have lots of passions so I don’t think that I won’t find one again. I know my passion is with the BC wine industry. I know it is what I will be doing. It is just finding the corner of it that I can carve out where I will really enjoy doing something that will add value to the industry as a whole and add value to the wineries still here. I was watching on social media that you were helping other wineries with this harvest. How did that feel that you did not have to be the person in control? I hope to do more in the future. I don’t anticipate in the next 6-8 months that I will stop doing that. I told wineries that when you start bottling in January, I’d like to help. I’m keen to work one day at a time at various wineries for $2 as that is the tradition now. When I decided to participate in the harvest when I came back from my Europe trip I knew that part was self-preservation as I didn’t want to come back to living on the property and watch the harvest at Tinhorn. I knew I wanted to get off the property. A lot of the wineries that I chose to work at are wineries that treat their people well and that for me is the core of things. I don’t want to work at a winery that makes the best wine but does not treat their people well. So I’ve chosen to work at these wineries as I think they are really good people and it gets me off the property. It is still a really difficult industry for wineries because they have to wear so many hats and have so many pressures on them. It is hard to succeed in all areas at all times. And so I think my ultimate goal is to find somewhere where I can give a better toolkit to wineries, especially small ones, who don’t have the resources to succeed in all areas. I know exactly what it is like to be busy. And not be able to link yourself much with the winery next to you as everyone is busy, but this is where we are going to win here, which is the more links we can put between wineries regardless of size, it is going to make the industry stronger. Maybe you will become the next Michel Rolland? I don’t know. I don’t have any issues consulting with wineries, but ultimately what I want to do is an industry-wide consultation rather than on a winery by winery consultation. I heard about VQA some of the smaller wineries were not too happy how the bigger wineries were doing things. This whole industry was built on size. The government gave out three different licenses – with perks and pitfalls. We are forever trapped with the small, medium, and large mentality. I hope to be able to change that narrative with every winery here being worth one vote. But that being said, don’t take anything from the big wineries. They are supporting many families and those are peoples’ lives. In one sense the large wineries have failed as they have not taken up the mantle and run with it and lead the industry. They have done what is best for themselves. They have not been leaders. We all need a Mondavi up here. This industry will have always a ton of small players regardless of the amount of consolidation. Again the important thing is to help give them a leg up on being able to run their business without running themselves mental. Is there a book/books that you have given people the most as a gift? No. In the early years, I used to give John Schreiner’s book out to people all the time, whichever one was current for that year. I find that still a valid thing to do. For me at the end of the day was to find balance in my life, and the wineries that can find balance in their work and home life, and can give that to their employees as well, are those that will be the really successful wineries. I think that the end game for success is to find a balance for you and your employees. What book talks about that? Probably a million of them. If I found a great book that spoke to that, that is what I would give out. If you could have a gigantic billboard along the side of the road anywhere, what would you say on it and why? If it had to be really short, #BCwinechat, *laughing*. I don’t know. I think if I had to have a big billboard with one word, I think it would be “empathy”. The more you can get empathy in your life and in your business the better. It is not a common thing to hear business people say this, but I thought we were wildly successful at Tinhorn especially in the last few years because we ran our business with empathy. I think that was noted by wineries like Andrew Peller and that was part of the reason we were attractive to them. They may not be able to put their finger on it. I do feel if somebody were to drive past that road sign and saw “Empathy” it would make them think twice about what they are doing in their own lives and in their work lives too. So that is the word I would use. Has BC planted the right grapes in your opinion? I think we are getting there. I love the fact that we are still exploring new varieties. It is a moving target with climate as well so we may as well push the envelope. I don’t see an issue with that. I think that there Is not one particular grape that will work out, but the north seems to be gravitating towards the right grapes. And the south seems to be gravitating overall to the right grapes. In the middle of the valley, it is a little more of a free for all, but it is allowed because it is that kind of climate. When you think about Summerland you think about Pinot Gris and Gewurztraminer as they do both so well there. When you think about Oliver and Osoyoos you think about big reds, Syrah, big Chards as well. Also some outlier grapes like Roussanne are pushing the envelope. In Kelowna it is all about the Gris, Pinot Noir and Rieslings. I’d say we are 30-40% being able to have real discussions of certain varieties in certain locations. We are just starting to get there. You can’t have those discussions till you have sub-appellations as you have to be able to guarantee to customers that the grapes came from a certain area. Besides the Okanagan you have the other regions, like Kamloops and Vancouver Island. I was on Vancouver Island a few weeks ago and went to Enrico winery. They had many Blattner varieties. It was very interesting. It is, and there are places in Crowsnest if you go east that do similar things with unique varieties. You see that in the US. The core 3 states, CA, WA, and OR are focused in their areas on the right grapes, but if you go further afield you get experimentation with different grapes. I think a similar thing happens here in BC. There is this core region and it is starting to break down into areas. But then you have a wild amount of areas that are being planted where you are going to come upon a grape you never heard of before. I think it’s wonderful. One last question. What advice would you give a bright driven student about to enter the wine world? Well it would depend on what part of the business they are entering. If they are entering from a viticulture standpoint I would tell them that they can write their own ticket if they like to work outside. 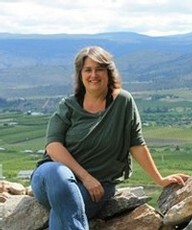 There is such a massive need for enthusiastic people, especially women to work in BC vineyards. Learn as much as you can about working with things other than viticulture, like management, computers, spreadsheets, so you will go far. In the cellar, a lot of people get into one focus and do not advance upward, but you have to keep adding to your skillset. Yes, you may be a trained assistant winemaker, but ultimately you may have a dead-end job or go from winery to winery unless you can start adding to your toolkit like finance, making budgets, managing people, or how to work in vineyards. Put in some time at good wineries and explore with them how you can tack more education on to make yourself more marketable. Lastly I’d say from an executive perspective, my goal is that the wine industry should hire more females. They need it. It is a wildly male-driven industry when you get to the top. When you listen to the workers at the bottom they don’t like the way that they are treated or how things are going, and I find again that women can add that sense of balance as they understand the pressures of running a business and raising a family. That kind of leg up on your competitor is vital. I feel a woman at the top or near the top, e.g. CFO, of a winery has a competitive advantage as they are looking at issues from a different perspective. If there was a female that wanted to get into that, I would say you can get your training in any industry and then you can join the wine industry; have an open mind to learn how to do finance or sales in the wine industry. Sales is a whole different beast. You don’t have to be a great wine salesperson to be a great salesperson. In fact the really bad salespeople are geekier. It is the whole person that comes to sell your wine. The one that has the ability to talk about other things happening in their lives or other interests. That is what makes the sale. It all comes back to well roundedness and tacking more things on to your toolkit. Thank you Sandra for being so candid and open with me. I learned alot about how the sale of Tinhorn Creek affected you, and about your love for BC wine and getting the whole industry into a better place. Grape luck in your future!